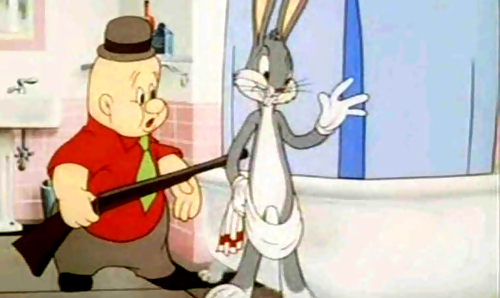 What do Bugs Bunny, taking a bath, and a precocious vocabulary have in common? This is a cautionary tale, a story of how ignorance and the nuances of language can combine with coincidence to convey an unintended message of a mortifying caliber. It is the true account of a boy who was unaware that the unpleasantness confronting him was a consequence of his own actions, for he knew not what he was doing. Thankfully he remained in this state of immaturity for several years, allowing his fragile psyche to recover from the staggering truth when, at last, the individual links merged into an undeniable chain of events. To appreciate the predicament fully, we must begin in the middle. Our protagonist – let’s call him, say, Bobby – is a quiet second grader at a Catholic elementary school. He is in the class of one Miss M., a teacher beloved by most students and yet prone to a certain foulness of mood when crossed. It is the very same Miss M. who once made a spectacle of her displeasure with Bobby’s older brother (whom we shall call B.J.) and the sloppiness of his desk by dumping B.J.’s accumulated possessions onto the floor before his peers. B.J. stood there stunned and uncomprehending, wondering why Miss M. did not simply order him to clean out his desk rather than unleashing her pent-up fury. But Bobby does not know about this darker side of his instructor, nor can he conceive that he is about to similarly provoke her ire. It starts with a glare. Miss M. is sitting at her desk grading papers when she abruptly looks up and directs a stern look of disapproval at Bobby. She summons him to the front of the room with a voice that is uncharacteristically harsh, the sort of tone that educators reserve for unrepentant troublemakers. But troublemaker is not an accurate description of Bobby, whose childhood neuroses have already fed a budding Catholic guilt (and vice-versa) to foster a timidity that renders him nearly incapable of willful defiance. No, our hero is not the sort who tries to get away with anything. The domineering nun who taught him in first grade has already nipped his ego in the bud. So it is with great bewilderment that Bobby warily approaches Miss M.’s desk. He is confused by her words, which he will be unable to recall upon later reflection. She does not come right out and say what it is that has upset her, but she is obviously irritated and maybe even angry. As she prattles on, Bobby tries to think of what he might have done that could have warranted such a reaction, but like a child trying desperately to invent meaningful sins while in line for confession, he comes up with nothing. He looks down at his shoes and endures his teacher’s wrath until he is dismissed to his seat. Naturally, though he cannot think of any transgression by which he would deserve such a strong reprimand, he nevertheless takes it for granted that he does indeed deserve it. Bobby is worried and puzzled. The worry will fade as second grade resumes without further incident, but the puzzlement will last for years. The Mystery of Miss M.’s Anger remains unsolved as Bobby grows older. The curious incident engages his mind now and then, especially whenever he reminisces about second grade, and over time it becomes the defining experience of that academic year. Still, its meaning stays elusive. What could he possibly have done to offend his teacher so deeply? Then, one day years later, the adolescent Bobby finds a clue. Preserved among the various ephemera of his youth is an essay that he wrote in second grade, and while the evidence it provides is by no means conclusive, it is certainly suggestive. The unconventional topic of the paper is, of all things, the experience of taking a bath. Here is where we must travel backward in time to the genesis of our story, for the causal chain truly begins with our protagonist sitting before the living room television watching cartoons. Though he is no more than five or six years of age, he has developed an ear for language and an appreciation of how certain words sound in juxtaposition with other words. In one cartoon, he sees the Sphinx comment on its existence with the admission, “Monotonous, isn’t it?” For weeks afterward, Bobby will carelessly insert the word monotonous into his everyday conversation with great amusement, only dimly aware of its meaning. Then there is a Bugs Bunny cartoon, and another lexicographic gem gleams before our young hero’s eyes. “Eh, confidentially,” intones Bugs as he conspiratorially begins to offer advice to his hapless victim. Something about the unfamiliar word appeals to Bobby, who files it away in his mental dictionary with the understanding that it sounds very good at the beginning of sentences. Some time later, Bobby is sitting at the family room table with pencil in hand, staring up at the ceiling in search of the right words for the essay that Miss M. has assigned. He is to write a personal narrative about a common experience, and so he has decided to address the universal practice of bath-taking. For Bobby, it is not a frivolous topic, as taking a bath involves much more than getting clean. In fact, personal hygiene is a mere by-product, because the real purpose of taking a bath is cramming the tub with all the boats, army men, and other assorted toys that can be hauled into the bathroom. There are wars to be bravely fought, races to be gloriously won, and potential drownings to be melodramatically thwarted. All of these remarkable scenarios unfold in the solitude of a bath. But how can one express all of this in a few words? Aware that not everyone is in the habit of taking toys into the bathtub, Bobby decides to emphasize his bathtime preference for play. Let’s see, he thinks to himself. When you’re out with your friends, you say that you are playing with friends. But when you’re alone, then you are by yourself. So when you are playing alone, you are playing with…who else? Yourself! He scribbles a few words onto the paper, silently rereads his effort, and decides that something more is needed. Not much, just a dash of something to give the sentence flavor. Bobby frowns in concentration. What are some good words I know? Confidentially, I like to play with myself. Suddenly the contemptuous grimace of Miss M. surfaces to the fore of his older-but-wiser brain. Maybe, just maybe, the mystery has finally been solved. And so, dear readers, I leave you with this gift. Always remember the lesson that I – er, I mean, that Bobby – learned that day. When you use words that you do not understand, you will at the very least sound like an idiot, and at the worst you might make somebody very angry. Oh, and it can be rather embarrassing, too. Confidentially, it’s a lesson I’m still learning. Haha that’s great! I always save your writing for when I can really take the time to read. It’s always a pleasure. Alex – You are too kind. If I install a “random testimonial” widget, I will have to include your generous words. Mary – Thank you, and thanks for sharing your own amusing story. Personally, I think the wrong call was made on that one. Imagine how much joy could have been brought to so many people had you only been permitted to distribute your valentines. Great story Bob! Having taught in that setting, I have seen the wrath of the Sisters. I, too, was often bewildered at some fits of rage, and I now wonder if I also offended with an ill-chosen vocabulary choice. Thanks, Michael! It’s a funny part of the human condition, I suppose, whereby Taking Offense At Perceived Intentional Vulgarities + Unwillingness To Acknowledge The Vulgarity = Rage. There’s comedy in there somewhere, I’m sure. Great story,Bob. I was quite aware of B.J. and the Miss M. incident. you were not expelled. Well writtten! Ha! Thanks, Dad! I guess it was too scandalous for Miss M. to even send a note home about it. Bob – you just absolutely have to start submitting your essays to some publications -they are priceless! I just had to read ahead to the offending sentence and laughed out loud when I saw it -the real question is, why was Miss M. not laughing out loud, too???? Well, some teachers have no sense of humor, you know. Thanks, Karen! There’s a lot of pressure on primary teachers to get it right, isn’t there? Here we are all this time later, and we still haven’t forgotten the negative impressions from those first years. I recall being pulled up by my ears by a certain less-than-kind first-grade-teaching nun I’m sure you must remember!